What shows drawings of the edges of the page? Often I have caught myself drawing something on record sheet during the phone (on-site negotiations, it would be bad) or listening to a story. It was also today at work talking on the phone; I instinctively started to pull on the paper outlines of a car. 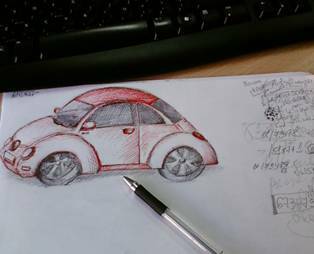 Later, looking out the window, I realized that simply "I’m drawing from nature" - through the office window was seen standing bright red New Beetle on the Brivibas Street. Car looked so cute, so I needed to get done the drawing. AsFreud once raged on the slip of the tongue, which is never accidental and have something to show the about inner soul, as well as drawings and scribble, on the edges of the paper,aren’t accidental. Sees' good time psychologists have studied unintentionally towed line correlation with human internal experiences. I will try to briefly summarize a few insights. 1stdrawing- shows that the inner emotional state is not as sunny as the outside would seem. You wish for a true friendship, and gentleness. Try not to avoid from people, but to actively engage in various activities. Concrete objects such as train, plane, ship or car tells about a desire to escape from the current talk, situations or place and be somewhere far away, physically or emotionally to stop some kind of a relationship, get out of the impasse in which you are in. 2nd drawing.- You feel that you have a high-risk or awkward positions. You have a tendency to hide offense, bitterness ball is usually swallowed, showing no anger to others. 3rd drawing- you aren’t worried about other issues now, or you don’t pay attention to them. Follow by your expressions, because you’re have fall into your trouble, don’t notice the other vulnerabilities, and can even unintentionally offend, insult by your actions or words. Wallpaper-like pattern, or pattern, which is constantly repeated and repeated to infinity, tells about some boredom during the telephone conversation or even present life. Everything seems tired. Try to get away from routine and uniformity that gets you tired, take a lot of energy! 4th drawing- you are full with warm feelings, you're ready to caress and kiss the whole world. It's not a bad thing, so don’t hide your sincerity behind the cool outer mask. Give a vent for positive emotions! 5th drawing- Crosses indicate a certain degree of guilt and denial of the internal conversation, which is currently taking place over the phone. But maybe you have been condemned by a man, which is now talking and you try these negative emotions or own this person to strike out of life? If thepicture recalls a chess board with light and dark squares, then it may indicate a complex situation where you have come. You want to bring clarity, so do not try to hide or conceal anything. A better recipe - speak a clear language, to give up a complexness and uncomfortable. 6th drawing– Aren’t you trying to avoid the responsibility and obligations, which seems beyond the reach? If the drawing represents beautiful people profiles, and it certainly shows that your work every day due to constant communication with people, and open communication. In addition, Creepy faces tell the story of strong dissatisfaction with the current situation and the inability or unwillingness to express this dissatisfaction openly. Psychologists believe that drawing different faces or trying to portray a particular people, in fact, drew themselves and their feelings. 7th drawing- you are not easily jockey because of the clearly known purpose and confidence in what you do. Always giving our opinion, without hiding both the negative and positive feedback. The only - Not to be tight, try to going to perceive more easily. If thedrawing reminds honeycomb pattern, then You tend for peace, harmony and balanced life. It could also reflect a desire to establish a stable family nest, but inability you to recognize its necessity. 8th drawing- You feel so as if you were outside all events, would like to stay back and watch all from the spacing. A variety ofspiral, abstract twists and turns could also be a sign of a certain artistic or freethinkers nature.